Viking Tyson Petticrew looks for a place to run. Pirate Mack Moderie takes a shot on goal. Pirate Robin Erickson battles for the ball. 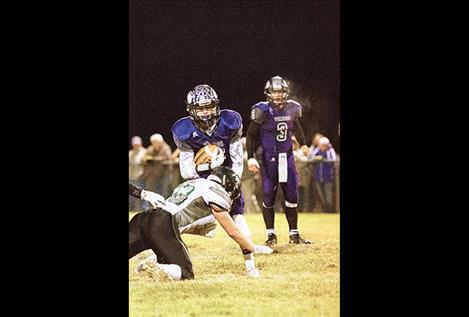 POLSON – The calendar has flipped to October, it’s a time when the weather begins to chill and the prep postseason heats up. During the next few weeks, the high school fall programs from across the Mission Valley will play their final regular season games and prepare for the possibility of postseason play. 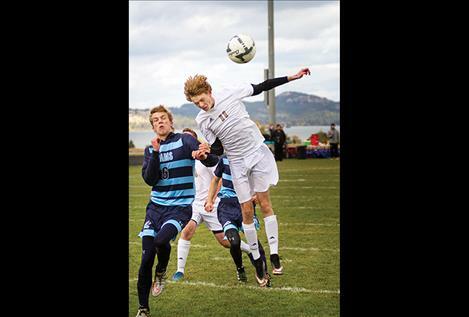 On Saturday, the Polson Pirates handily defeated the visiting Loyola-Sacred Heart Rams 6-0 in first-round state soccer playoff action. 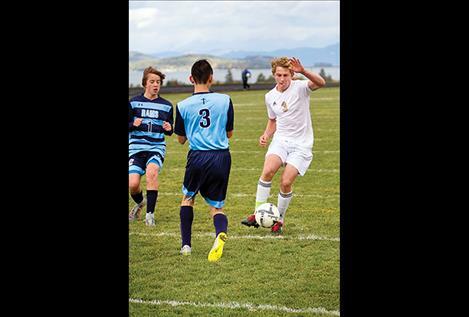 Alex Wall-Wilbert scored a goal and two assists, while Robin Erickson scored a goal and an assist. Overall, the Pirates had six different scorers in the win that advances them to next week’s state semi-final round against defending State Class A Champion Belgrade. In a rematch of last year’s state soccer playoff match up, the Lady Pirates traveled to Hamilton to face the Lady Broncs. Last season’s match up saw the Lady Pirates victorious in a 4-2 win over the top ranked Lady Broncs, however this year the Lady Broncs prevailed in a hard fought 2-0 battle. The loss ended state title chances for the young Lady Pirates squad. On Saturday, Western Class A cross-country divisionals were held in Frenchtown at the King Ranch Golf Course. Polson’s Bea Frissell won the girl’s individual title with a time of 18:36.59, while teammates Naima Crowl (19:21.2) finished in fifth and Molly Sitter (20:15.7) placed ninth for the Lady Pirates. Ronan Maidens’ top runner was Lindsey Brooks (20:18.09) finishing in 12th place. On the boy’s side, Quin Stewart (17:06) was the top runner for the Pirates, finishing 11th nearly six seconds better than Ronan Chiefs’ top runner James Normandeau (17:12.2) who came in 13th. Missions Bulldogs’ top finishers during the Western B cross-country divisional at Rivers Bend Golf Course in Thompson Falls were Isaiah Nasewytewa (18:56.10) finishing 15th and Karolyna Buck (23:07.18) in at 10th. The Charlo Vikings took three of the top four spots to win the boys team title during the Western Class C divisional cross country meet on Thursday at the Arlee Fish Hatchery Challenge. Charlo Viking Wills Degrandpre won the boys’ individual title with a time of 18:23. Arlee’s top boy finisher was Jason Miller (21:34) at sixth place and Two Eagle River’s Dylan Moran (22:07) was the Eagles top finisher at ninth. On the girl’s side, Arlee’s Shawntaya Nelson ran a 22:49 second place and Jaden Coston (23:25) was the Charlo Lady Vikings’ top finisher at fourth place. All Mission Valley cross-country teams will finish the season on Saturday at the State Cross-Country Championships in Helena. 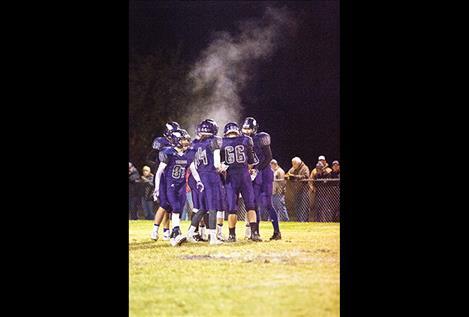 Race time is 11 a.m.
Once again, the Charlo Vikings football team is in the heart of the postseason State Class C title race. On Friday, the Vikings lost to visiting Flint Creek 46-28 in a divisional game to decide first and second seating in the Western C.
Quarterback Landers Smith ran the ball 24 times for 206 yards and two touchdowns. He finished the game 6 for 21 passing for 98 yards and a touchdown. Tyson Petticrew had 5 catches for 89 yards and a touchdown. The Vikings will kick off the playoffs by hosting the third seed from the south on Oct. 28 at 1 p.m. In a win you’re in game, the Arlee Warriors dismantled visiting Victor 52-6 on Friday evening. Warrior running backs Darshawn Bolen and Will Mesteth both rushed for two touchdowns apiece and quarterback Lane Schall threw a touchdown pass and ran for a 20-yard touchdown in the must win game. The Warriors will host Plains on Friday to decide the third and fourth seed in the Western conference.